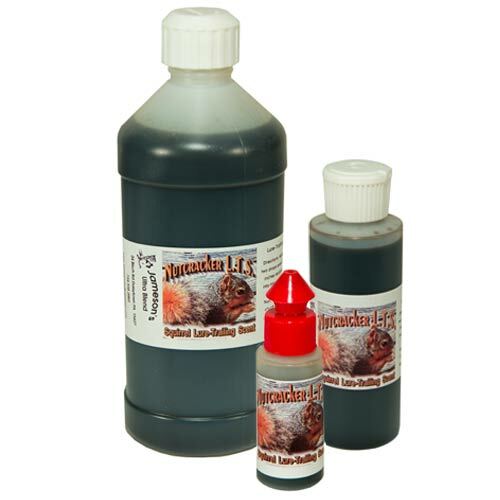 It is a heavy oil based food call lure developed specifically for all nut-eating rodents. Its nutty fragrance will endure arid climates and still give off its unique nutty fragrance. Excellent for leading squirrels into cage traps and works wonders when used in combination with the Nutcracker Paste Bait. INSTRUCTIONS FOR USE: Lures are used to attract target animals to your set from a distance. They are either a gland, food or curiosity attractant. Food lures or scents appeal to their desire to eat. Wire a shelled peanut at the back of a trap and place 8-10 drops of the lure on it.